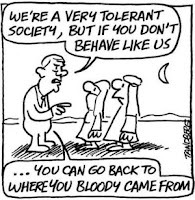 Werner's Cairns blog: Muslims and Multiculturalism not a happy mix in some countries. The contentious issue about Muslims is in the spotlight in Canada & Holland. First some excerpts from an excellent article from the Calgary Herald Canada. This is followed by an article from Holland. I'm actually surprised that the “Calgary Herald” had the courage to publish this, but the truth has to be told. Wake up Australia! This is a must read for all Australians; especially our federal Politicians! It is a well known fact that many European countries have an issue with the Muslim population they once readily welcomed to their country. They all discovered that Muslims do not integrate or assimilate into their respective countries, and produce abundantly more children than the native population of the host country. In time the Muslim population will be in a majority, and they all know what that means and, are extremely worried about it. I’m told that the Muslims are a drain on the host country’s welfare system. Well, they have learnt that hindsight is an edifying tool, but an egg cannot be unscrambled. Here is what German Chancellor Merkel said: "German attempt at multiculturalism has 'utterly failed;' she wants immigrants to learn German." Read more. Time to Change Tune on Official Multiculturalism. Mahfooz Kanwar, a member of the Muslim Canadian Congress, says he has a better idea. "I'd tell them, this is Canada, and in Canada, we teach music and physical education in our schools. If you don't like it, leave. If you want to live under sharia law, go back to the hellhole country you came from or go to another hellhole country that lives under sharia law," said Kanwar, who is a professor emeritus of sociology at Mount Royal University in Calgary. "Immigrants to Canada should adjust to Canada, not the other way around," he argues. To read the full article, click on this link. Now to Holland; here is what they are doing. A new integration bill, which Dutch Interior Minister Piet Hein Donner presented to parliament on June 16, reads:"The government shares the social dissatisfaction over the multicultural society model and plans to shift priority to the values of the Dutch people. In the new integration system,the values of the Dutch society play a central role. With this change, the government steps away from the model of a multicultural society." The letter continues: "A more obligatory integration is justified because the government also demands that from its own citizens. It is necessary because otherwise the society gradually grows apart and eventually no one feels at home anymore in the Netherlands..."
I greatly admire professor, Mahfooz Kanwar, for his courage to speak out, I would like to find an eminent Australian Muslim, with such courage, but I doubt that there is one in Australia. It is refreshing to hear a person of the Muslim faith to say what we Australians have thought for a long time, but never had the courage to say it. Thanks, Werner for this interesting and revealing posting. Interesting! Holland has shown to have the intestinal fortitude and is doing something about their Muslim migrant problems. The Calgary Herald is to be admired for having the courage to write something about their Muslim problems. The German Chancellor, Merkel, was honest enough to admit that multiculturalism in her country is an utter failure; they have regretted now to have taken so many Muslims in. 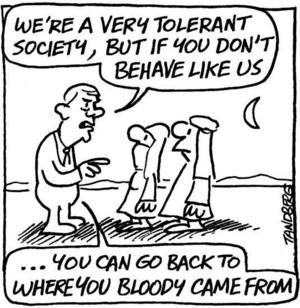 I wonder when our mob in Canberra will realise and admit that they are letting the wrong people into this country. Why on earth would Muslims want to come to an “infidel” country, why don’t they go to a Muslim country? We have enough problems as it is, we don’t need more. And finally, thank you, Werner, for bringing all this into the open. our boat people send their children ahead of them knowing that our do-gooders can't say no to them , once here the rest of the family can't be refused legally no matter what type of persons they are . here isn't that against the laws covering the refuges convention for a start . put them to work building roads across our deserts , that would soon stop the boats !. This is definitely a must read posting. I must admit that I’m a bit ignorant and not following too much what is going on in my country or in the world. I’m a mother of five and have my hands well and truly full. It is quite obvious to me now what the aim of the Muslims are, and that is to get the numbers and then impose sharia law to their respective countries that were good enough to let them in. Our way of life would be lost, seeing that music and many other things we take for granted is against their religion. Don’t our politicians see what is going on in the world and the problems that are caused by Muslims? I admire the Dutch and the Canadians for doing something positive and trying to give the country back to their “native” inhabitants. I’m worried for the future of our children and grandchildren. BHP Billiton to Sign Off on Expansion of Olympic Dam with no accountability to Law Or transparency to the people. This Gillard government seems to have no idea what they are doing to this country. We should take an example from Canada and Holland, they have now woken up that Islam and Christianity is incompatible.